Riders In The Sky are truly exceptional. That Riders In The Sky was even formed is a feat of improbable likelihood. 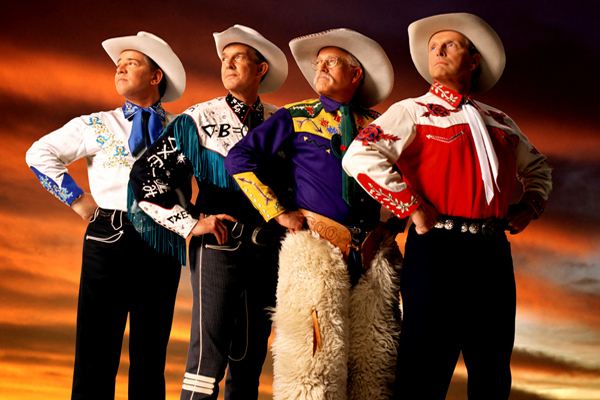 What are the odds that a theoretical plasma physicist, a wildlife manager – galvanizer – Life Scout, an English major – shot putter – Bluegrass Boy, and a Polka Hall of Fame member would collectively become “America’s Favorite Cowboys?” And even more unlikely is that 30-plus years later, the original members are still “bringing good beef to hungry people” while putting up Ripken-like numbers! The Rolling Stones only made it a few years before replacing Brian Jones; the Sons of the Pioneers constantly changed personnel; even the Ringo-era Beatles only lasted 8 years. (Perhaps Too Slim, as a sophomore writer for the University of Michigan Daily, had an ulterior motive in 1969 by propagating the rumor that Paul McCartney was dead! It’s true… go ahead and Google “Paul is dead rumor”…) But the key to keeping the same founding members intact for three decades on the road is more easily explained: “Separate hotel rooms,” cracks Ranger Doug! Riders In The Sky’s first official public performance was Nov. 11, 1977, at the erstwhile Nashville nightspot “Phranks & Steins.” Taking the stage that night for a crowd of eight or nine (counting Herr Harry behind the bar) were Ranger Doug (Idol of American Youth) on arch-top guitar and baritone vocals, and Too Slim (A Man Aging Like Fine Cheese) on bunkhouse bass, face, and tenor vocals. A chain saw may have been in the mix somewhere that night, but was soon retired. Replacing the chain saw was Woody Paul (King of the Cowboy Fiddlers) on fiddle, tenor vocals and rope tricks, and the launch was successful! They subsequently added the “Stomach Steinway” stylings of Joey the Cowpolka King on accordion and baritone vocals, much to the delight of ‘Polkaholics’ everywhere. As a classic cowboy quartet, the trail has led them to heights they could have never predicted. 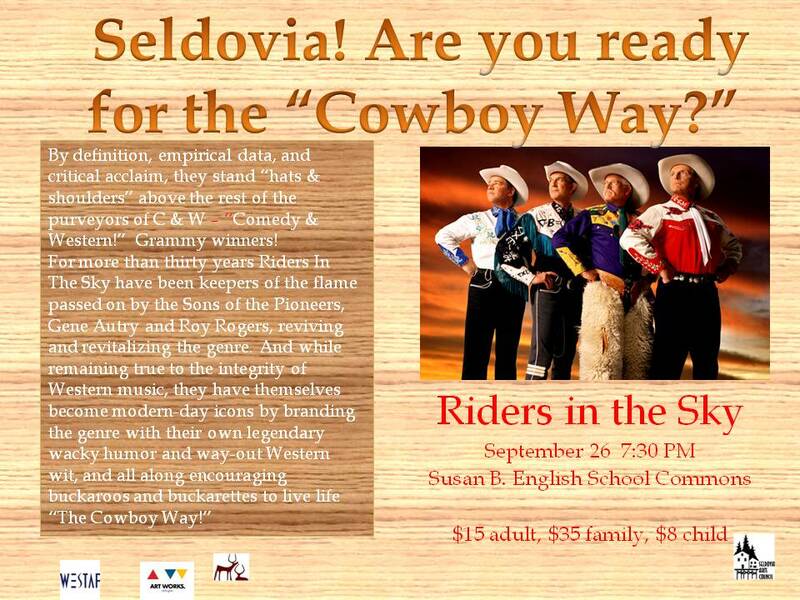 Riders have chalked up over 6100 concert appearances in all 50 states and 10 countries, appearing in venues everywhere from the Nashville National Guard Armory to Carnegie Hall, and from county fairs to the Hollywood Bowl. Their cowboy charisma and comedic flair made them naturals for TV, and landed them their own weekly show on TNN, as well as a Saturday morning series on CBS. They have been guests on countless TV specials, documentaries and variety shows, appearing with everyone from Barney to Penn & Teller. And their animated likenesses have shared the screen with Daffy Duck on the Cartoon Network, and the Disney Channel’s Stanley. If you consider their compositional credits, one might call them “Writers In The Sky!” In addition to penning award winning songs for their own albums, they wrote the score for Pixar Animation’s 2002 Academy Award-winning short “For the Birds.” They composed the theme song for the internet cartoon show “Thomas Timberwolf” by renowned Bugs Bunny creator Chuck Jones. But the animated character that history will most certainly link to Riders In The Sky is the loveable cowboy Woody, as Riders performed “Woody’s Round Up” in “Toy Story 2,” with the album of the same name garnering Riders their first Grammy Award in 2001 for “Best Musical Album for Children.” Two years later, Riders roped their second Grammy in the same category, for “Monsters Inc. – Scream Factory Favorites,” the companion CD to Pixar’s award winning movie. Equally as exceptional, but of greater significance, is that in 1982, Riders In The Sky became the first, and to date only, exclusively Western music artist to join the Grand Ol’ Opry, the longest running radio show in history, and thus began a love affair with radio as well. In 1988, they recorded comedy skits for the album “Riders Radio Theatre” and launched the long-running international weekly radio show of the same name on public radio. And keeping pace with the ever-changing technological landscape, in 2006 “Ranger Doug’s Classic Cowboy Corral” debuted on XM Satellite Radio, still heard weekly on SiriusXM Channel 56. Yes, it would be “The Easy Way” to call it a career after 30-plus years, but it wouldn’t be…”The Cowboy Way!” And so, the never-ending trail drive continues. The ponies are rested and watered, and America’s Favorite Cowboys are ready to saddle up and ride, bringing good beef to hungry people wherever they may be. Yes, Riders In The Sky are truly an exception to the rule.